Our last camping trip for the season brought Lady T to scenic Cape Cod, Massachusetts, where we chose the Cape Cod Camp Resort in Falmouth for our stay. Commonly referred to as simply “The Cape”, Cape Cod is a collection of small towns & islands jutting out into the Atlantic Ocean in Eastern Massachusetts. As a whole, the Cape is a huge tourist destination but it is perhaps most famous for Martha’s Vineyard & Nantucket, two small summer colonies that attract visitors from all over. After a busy summer, we were both looking forward to a long weekend relaxing and exploring the area. We arrived at the campground at about 2:30 PM on Thursday, September 4th, checked in and drove down to our site. We initially experienced some frustration with confirming our reservation but the office staff were friendly & helpful. Our site was situated on a shallow slope & was spacious & clean. We got Lady T squared away & then took a short bike ride around the campground to check out the amenities. The property was much larger than we expected & included two pools, a playground, dog park, game room, beach with rental boats & two bathhouses! Jay decided to take a swim before dinner so we looped back around to the campsite so he could change. The larger of the two pools was already closed for the season so we rode our bikes to the smaller pool, which also had a separate hot tub. After a quick swim, it was back to Lady T for dinner and relaxing by the fire. Friday morning, we took a taxi over to the ferry terminal and boarded the Island Queen ferry to Martha’s Vineyard. It was a quick but scenic 40 minutes to “TheVineyard”. We had planned to rent scooters to explore the island but our taxi driver informed us that the roads were very narrow and dangerous for inexperienced riders. Even though we both own motorcycles, we opted to rent a car instead, which ended up being a little cheaper. Our ride for the day was a 2014 Fiat convertible…a cute little car that was tiny enough for the island’s narrow roads. We were both hungry by this point so I searched online for a vegan-friendly eatery in the area & came up with a place called the Scottish Bakehouse in Vineyard Haven. It looked interesting & the reviews were good so off to the Bakehouse we went. Ordering our food was pretty quick but it all went downhill from there. The gal at the register charged my credit card for someone else’s order and then told me she couldn’t provide a receipt for the credit. When I asked to speak to the manager, the cook came out and offered to give me the number for the charge software company so I could confirm the credit with them.(?) After waiting for about 5 minutes for our food, another person informed me that the “all day breakfast” item I ordered was not available. I was considerably aggravated but was happy when the food finally came out. The stir fry I ordered was mediocre and apparently wasn’t vegan after all. I had about three bites when I pulled a long disgusting hair out of my mouth! Needless to say, I received a full refund for our entire order & was so disgusted that I didn’t eat anything else until several hours later. The island redeemed itself at Fat Ronnie’s burgers in Oak Bluffs, where I had the most delicious handmade vegan burger, hair free. Spending the remainder of the afternoon exploring we visited Vineyard Haven, Oak Bluffs, Edgartown (including the Edgartown Lighthouse) & Tisdale, picking up a few doodads and watching all of the tourists. In Oak Bluffs, we visited a unique store called The Lazy Frog. The Lazy Frog offers many cool toys, old and new, and is a one-stop shop for all things disc golf. We chatted for a while with Jake, the proprietor, and he explained the story behind the Lazy Frog. You can visit The Lazy Frog online at http://lazyfrogmv.com/. We also visited a few of the beaches to search for shells & beach glass. When the time came to return the car & hop on the Island Queen back to the mainland, I was happy to be going back to camp. I have to admit that we were definitely underwhelmed with Martha’s Vineyard & wouldn’t return anytime soon. I guess it’s not for everyone but you don’t know until to make the trip. By the time we got back to the campground, it was dark. We switched on our lights & enjoyed a burrito dinner by the campfire. Saturday we had rented a car, a Hyundai Elantra from Enterprise, & spent the day cruising around the mainland, stopping at several yard sales along the way. We visited the historic downtown area of Woods Hole & stopped at the Nobska Point Lighthouse, where a wedding party was just departing. We waited for everyone to clear out so we could take some pictures and then cruised around the small stretch of coast we had access to. It was a gloomy day so there wasn’t much else going on in the area. 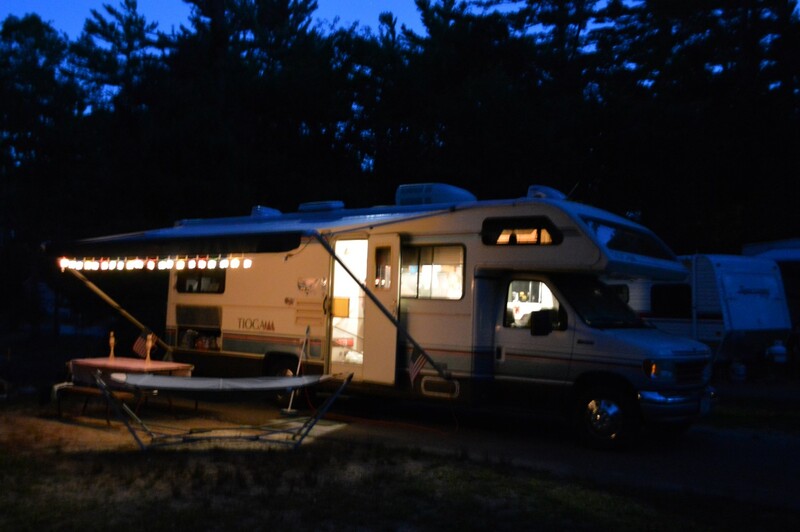 We returned to camp just after dusk and stowed our spoils for the day, which included an awesome wind spinner I picked up at a yard sale and lots of cool shells! After dinner, we enjoyed the rest of the evening by our last campfire of the season (maybe), taking in the smells and sounds that make camping so wonderful. Sunday morning, Jay returned the rental car while I packed up camp & then we headed home. We are looking forward to spending the cold months planning our extended excursion for 2015! Stay with us through the fall and winter, as we will continue to post videos from our Route 66 road trip. See you on the road!